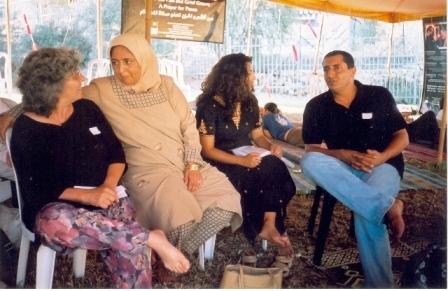 The Parents Circle - Families Forum (PCFF) is a joint organization of several hundred Palestinian and Israeli bereaved families. Each one of the members has lost an immediate relative – a child, a parent, a sibling – in the conflict affecting our region. The organization's members, both Israeli and Palestinian, have decided to lead together a movement for peace, reconciliation and tolerance between the two peoples, to prevent further suffering like theirs. The members work together to leave behind the path of violence and revenge and choose dialogue and close cooperation to promote empathy, tolerance and trust culminating in reconciliation, as a necessary unavoidable step in the way to reach peace. The PCFF strives to promote change and reform on the ground, in people's minds, their consciousness, their thoughts and perceptions of the "other." The PCFF's ultimate wish is to seize the opportunity to effect a grassroots change by bringing the impact it has had of its message, to average Palestinian and Israeli citizens, transforming their perception of the conflict, its prospects and the other side. Since 1995, the bulk of the PCFF's effort has been directed at programming and increasing public awareness about its mission and activities. The PCFF first began outreach to a wider population by creating programming for adults and in schools. 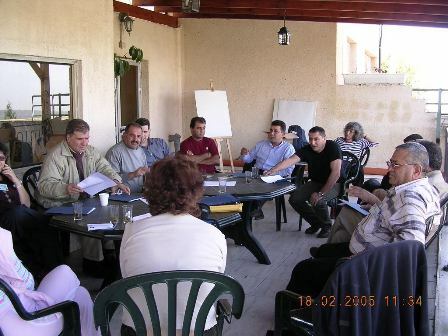 The PCFF believes that in order to affect the greatest amount of grassroots mobility for reconciliation, it must bring its mission, values and strength to a much wider community through an on-going concerted effort to engage the Israeli and Palestinian people in dialogue, debate, thus preparing a framework for al long-term reconciliation process when formal agreements are signed. In its vision for the future, the PCFF's core mission is to empower grassroots reconciliation as a vehicle for change, by working on the ground with groups to expose as many individuals as possible to the experience of engaging in reconciliation. Central in the PCFF's efforts is the belief that face-to-face contact with and dialogue with people from the "other" side and exposure to their humanity is the most practical step that can be taken to promote changes in public opinion and support for peace. The PCFF believes that by empowering people at diverse levels of society to engage in dialogue and reconciliation, its work enables groups often left outside of peace building efforts to take a personal and meaningful part in the process. The power and the appeal of the group is based on a deep respect that the two peoples, Palestinians and Israelis, have towards the memory of the fallen in the war and their families. Every bereaved family and its message have open channels to the public. The leverage of the families involved in the PCFF is the concerted action of hundreds of families carrying a deep emotional message. Reconciliation between people and nations that have known long periods of conflict is a long and complex process, an important component of which is deeply emotional. The compassion, empathy, openness that bereaved families across the borders are able to develop towards each other become formidable weapons in the effort to break through the walls of hatred, suspicion and fear which are huge obstacles and defenses on the way towards reconciliation. 1. Dialog encounters: this is the longest and most thoroughly tested methodology. It has been increasingly implemented since approximately eight years, mostly in secondary schools and colleges at class level and at the higher classes. The predominant model is a one and half hour meeting with two PCFF lecturers-facilitators (one Israeli and one Palestinian), in which each one shares his personal story and tragedy with the class, expresses his views on reconciliation and opens a dialog with the youngsters. For most of them this meeting is the first one with somebody of the other side. Feed-back forms which are distributed at the closure give us a precise idea of the quality and size of the impact, the emotional breakthrough that took place in the class. 3. Strong Emotional Public Displays: like the coffins display at the center of Tel Aviv and later at the Hammarskjöld Square, near the UN at New York in the spring of 2002. The "coffins" covered with the two national flags represented the tragedy and senselessness of violence when the Intifada crossed the thousand two hundred fifty fallen, from both sides. This display reached the world media with a very dramatic and emotional message. 4. Using TV to transmit our message: at the initiative of the PCFF a ten chapters TV drama series was produced for the Israeli Second Channel. "Good Intentions" in 2008 reached an important segment of the public with a very emotional story of two ladies chefs , an Israeli and a Palestinian, whom a TV program on food, brings together, with their families, their peculiar problems and preoccupations and finally with their personal tragedies. The series stressed the importance of the human dimension and empathy, which overcomes fear and pain, and opens perspectives of hope and optimism. This series was possible thanks to the support of the USAID. 5. Using art to open hearts: 135 of the most distinguished Israeli and Palestinians painters and sculptors responded to the artistic and emotional challenge presented by the PCFF: express the wish for peace and reconciliation in a standard identical ceramic bowl which was handled to the artist. The most amazing collection was produced and exhibited in Israel in 2006 and later in the USA (Washington at the World Bank Bdg, at Brandeis University, The UN Headquarters during the General Assembly and finally at the huge SOFA Chicago Art Fair where most of the exhibits were sold and the benefits of the sale went to the educational work of the PCFF. 6. Knowing is the Beginning: the understanding that knowing, admitting the legitimacy and respecting the narrative of the other is of fundamental importance in the development of a culture of peace and of reconciliation motivated the PCFF to develop a program that identified the two central traumatic events to the two peoples: the Shoa (the Jewish Holocaust) and the Naqbah (the Palestinian Disaster). The two sides were invited to learn and recognize the historic importance of the other's trauma. Historians of both sides presented the two perspectives on the same events and later individuals and families, members of the PCFF, met each other and developed joint narratives of the encounters in which the two stories were equally reflected. This project took place in 2007-8 and was funded by the Japanese government. The new stage of this project, to be implemented in 2010, is intended to extend the approach to groups beyond the membership of the PCFF and is to be funded by the USAID. The PCFF has developed a wide range of monitorig technics to assess the efectiveness of its programs: feed back forms, scientific research , etc. Dialog encounters have reached at least 250,000 youngsters since be launched, more than half a milion viewers have watched the TV series "Good Intentions" and most of the people and the leaders of the region know about our work and fundamental messages. We believe that our work has contributed to create a climat of openness among the people, so that if a negotiated political solution to the conflict would be presented, a vast majority of the population would support it. Political obstcles, emerging from difficult violent situations have been serious obstacles at various moments of our organizational life (wars in Lebanon and Gaza, Second Intifada). People had to face mostly verbal attacks for continuing meeting each other. Another serious obstacle for our work is the lack of resources, which threatens every year our work and force us to devote tremendouyd energies in raising the necessary funds. We believe that the people and organizations that are sensitive to the conflict in our region, should do the utmost to encourage the two sides to dialog, discuss ane try to solve the conflict internally, rather than take a unilateral position of supporting one of the sides. This late approach, reaches the opposite results as people do not agree to be under the pressures of foreigners that know the facts partially and are perceived as having their own agenda rather the agenda of the people suffering in the regon itself.